Culture Minister visits scene of Hamas terror attack north of Jerusalem, meets with IDF commanders in the region and local council heads. 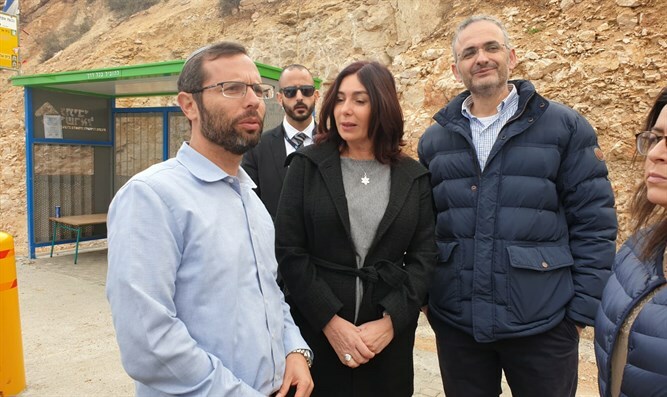 Culture Minister Miri Regev on Sunday visited the Givat Assaf junction in the Binyamin district of Samaria, where two IDF soldiers from the Netzach Yehuda Battalion were murdered in a Hamas shooting attack. Minister Regev spoke with IDF commanders of the region, as well as with the head of the Beit El Council Shay Alon Council and Yisrael Ganz, head of the Binyamin Regional Council. Regev told the local council leaders that she "came to show her support for residents and for the settlement [movement]. I also came to declare that I'm in favor of restoring the checkpoints and I'm in favor of policies for the deportation of terrorists," referring to a bill under consideration by the Knesset which would empower the IDF central command to expel the families of terrorists. From Givat Assaf, Minister Regev continued to Amona, where she is visiting the community, renewed recently on lands purchased by Jews. At Amona, Regev met with the parents of Shira and Amichai Ish-Ran, two of the victims of the drive-by shooting attack outside of Ofra earlier this month. The couple lost their newborn son three days after the attack. "Life will prevail, terrorism will never defeat us," Regev said. "It is important for you to be here as well at this brief but important event." This morning, Regev responded to the question of whether she would come to Amona despite the order issued by the head of Central Command, "I have no intention of violating a commander's order, but I do intend to reach Amona and encourage the residents."